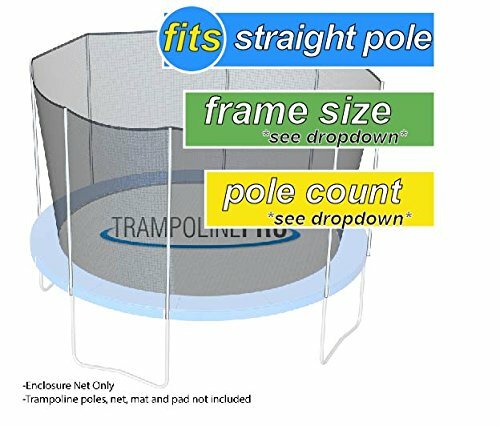 Nets For Trampoline Enclosures | By Trampoline Pro | Select Your Pole Type | Select Your Size, Shape, and Number of Poles | NETS ONLY (Straight Poles, 14ft Frame - 8 poles) by Trampoline Pro at Scruffs Game. MPN: 511418. Hurry! Limited time offer. Offer valid only while supplies last. DURABLE - Industrial Grade Zipper plus Net is Weather and UV resistant, anti-bacterial, and anti-fungal! NO RISK - 30 day return policy and 6 month warranty! NET ONLY - Trampoline and poles are sold separately!